In drought years, California usually reduces “environmental water flows” — the amount of river flows needed to maintain aquatic ecosystems — to make more water available for farms and cities. The current drought has been no exception. Depriving fish of adequate river flows, however, might not be in the interests of urban and agricultural users if it leads to long-term decline of species. Reductions in environmental flows during the 1988-92 drought arguably sped the expansion of destructive clam and aquatic weed populations in the Sacramento-San Joaquin Delta. 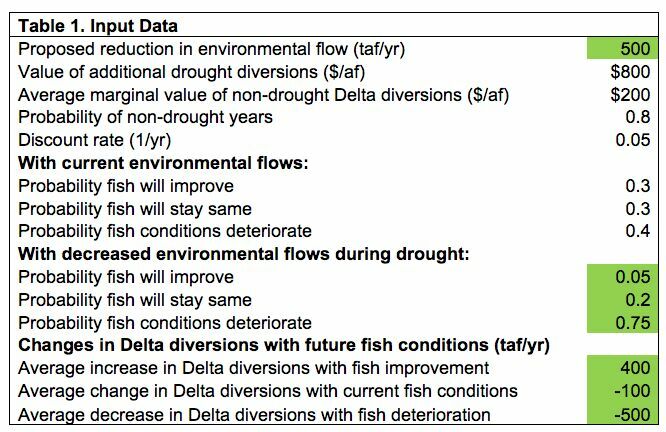 These invasive species have wreaked havoc on the Delta’s ecosystem and likely contributed to the decline of several open-water species, including delta smelt and longfin smelt (Winder and Jassby 2011; Sommer et al. 2007; Thomson et al. 2010; Moyle and Bennett 2008). Reductions in cold-water releases from Shasta Dam helped lead to the 1990 listing of the winter-run Chinook salmon (Moyle et al. 2008). A recent study indicates that most California native fishes will suffer severe declines with climate change and eventually qualify for endangered species listings if deprived of adequate cold-water flows (Moyle et al 2013). Diverting environmental flows to water users can lead to additional Endangered Species Act listings of native fish. This could require increased environmental flows to protect the listed species and jeopardize water diversions in the long run. If the long-term value of the lost water supply is high enough, curtailment of environmental flows during a drought might not be worthwhile for most water users. Consider the example in Figure 1, in which a simple risk-based decision analysis explores the long-term economic benefits to water users (not necessarily caring about fish). 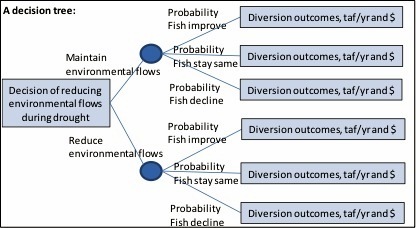 The diagram shows a range of decision options – to reduce environmental flows or not – and a range of likely consequences for each decision – showing and structuring the effects of uncertainty and their consequences. 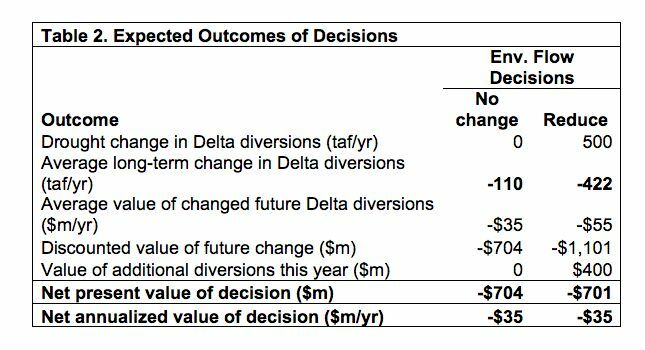 Table 1 gives rough numerical values for costs, benefits and consequences of each decision. And Table 2 shows results from the risk-based calculations. In this case, the values in Table 1 have been set to show the plausibility that a 500,000 acre-foot reduction in environmental flows might not provide a net long-term economic benefit to water users. Progress in California water management and policy will require stakeholders to move beyond habitual conflicts and look toward their common long-term interests — for both water deliveries and the environment. Keeping native fish populations healthy may be the best long-term strategy for many water users. 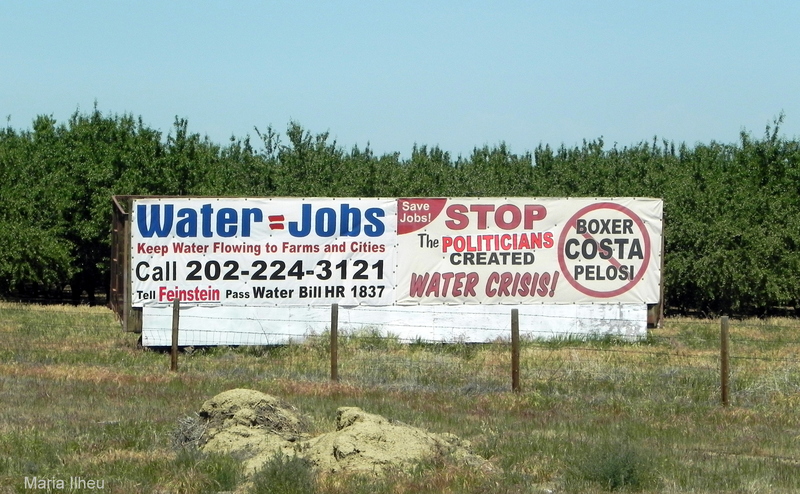 Jay Lund and Peter Moyle are with the Center for Watershed Sciences at UC Davis. Lund is a professor of civil and environmental engineering and director of the center. Peter Moyle is a professor of fish biology. Raiffa, H. (1970), Decision Analysis: Introductory Lectures on Choices Under Uncertainty, Addison-Wesley Publishing Co.
Moyle, P.B., J.A. Israel, and S. E. Purdy. 2008. Salmon, steelhead, and trout in California: status of an emblematic fauna. UC Davis Center for Watershed Sciences. 316 pp. This entry was posted in Uncategorized and tagged drought, Jay Lund, Peter Moyle. Bookmark the permalink. 16 Responses to Is shorting fish of water during drought good for water users? I don’t quite understand. The south-of-Delta water contractors are receiving zero (CVP) and five (SWP) percent respectively of their contracted supplies (a total of about 200,000 acre-feet). Reservoir inflows are essentially passing through. How are environmental flows being reduced to provide more water for farms and cities? Who is getting the water? Every interest suffers in a drought. When there is less water, most uses, including the environment, can expect to get less water. But regulatory agencies and water users both have an interest in seeing that the balance of drought reductions does the least overall long-term harm. It might be that cutting fish flows too much can harm agricultural and urban water users in the long run (the point of this post). Similarly, some cuts to agriculture, such as some rice fields, are likely to increase harm to waterfowl. Thank you for broadening the perspective in consideration of the whole instead of just focusing on farming demands. Taking additional water for agriculture does not serve the best interests of the environment or the state based upon economic benefit or social benefit analysis. Pingback: Best Long-Term Drought Strategy – Keep Native Fish Populations Healthy | California Trout, Inc. There are a lot of “ifs” in this post but one thing is absolutely certain: the acknowledgment that environmental water is a component of California’s dedicated water supply. That may sound silly but for a quarter century or more reporters and water policy activists have tried to convince the public that farmers use 80 percent of California’s water supply, which is simply not true. They do this by ignoring environmental water flows. If farms, indeed, use 80 percent of California’s water then a tiny bit of conservation would yield enormous benefits for the rest of the water users in the state, right? Wrong. The Center for Irrigation Technology at CSU, Fresno reported in 2011 that only a small percentage of agricultural water is potentially available for increased water use efficiency. Farmers have for a long time been implementing highly efficient irrigation practices to improve water use efficiency and crop production. Additional water transfers from agriculture to other users, such as the environment, can only be accomplished with widespread land fallowing, according to the CIT report. This post also begs the question: If it’s a good idea to leave more water for environmental purposes during a drought, isn’t it also a good idea to produce environmental water management plans? That way we would know if the water dedicated to the environment is doing what it’s supposed to do. Urban and agricultural water users are required to produce water management plans. It makes sense that taxpayers who foot the bill for public benefits, such as a “healthy” environment, have some idea whether their money is doing what it’s supposed to do. So far this year about 2 million acre-feet of water went unused by people and instead flowed to the ocean with no measurable endangered species benefit. It’s time to be honest about water policy decisions and agree, as the Department of Water Resources states in the California Water Plan, that fully half, and a growing percentage, of California’s dedicated water supply is used for environmental purposes.